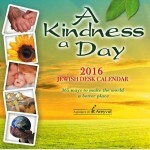 Areyvut, a New Jersey-based nonprofit organization whose mission is to infuse the lives of Jewish youth and teens with the values of chesed (kindness), tzedakah (charity) and tikkun olam (repairing the world), has released its 2016 A Kindness a Day Calendar. This flip calendar offers 366 suggestions (it’s a leap year!) for people of all ages to better themselves, their communities and the world at large. For example, Jan. 1’s entry suggests, “make a New Year’s resolution that will positively impact someone else’s life.” Other entries remind readers to “call and wish Shabbat Shalom to an out-of-town relative” or to “assist someone who is unemployed with writing a resumé and finding a job.” Beneath each act of kindness is a traditional Jewish text that explains from where the act of kindness is inspired. Areyvut debuted A Kindness a Day in 2005 and continued to create calendars through 2009, the last year that the flip-book was published. Despite a six-year hiatus, the A Kindness a Day calendar is back with suggestions, sources and inspiration that will hopefully help readers to play a more active role in their families and communities. The 2016 calendar also includes a thematic index that categorizes the acts of kindness by theme (for example, loving your neighbor, tzedakah, tending to the sick, volunteering, prayer, etc.) and a glossary of terms. Calendars can be purchased on Areyvut’s website areyvut.org/shop. For sample pages, and additional information, email [email protected].